Flip your bar upside down with every tune-up or when you sharpen your chain. The chain wears on the bar unevenly with more abrasion on the cutting side (the bottom in most cases). The culprit in gasoline from the filling station is ethanol. Between 10% (E10) and 15% (E85) of “gas” is this 200-proof alcohol additive. Think of it as a super-flammable cocktail for your car. It reduces emissions and absorbs water; the latter feature makes it unsuitable for long storage. Since most 2-stroke oil is sold pre-measured for a one-gallon batch, you might not be able to use up the mixed fuel while it’s fresh. Solution: Stihl MotoMix. This 92-octane fuel is pre-mixed with 2-stroke oil and may be stored for two years. It’s sold by the quart or gallon, and though it is expensive, consider the cost and inconvenience of constantly disposing of old gas. Bar and chain lubrication is imperative; don’t allow the reservoir to run dry. To test that the oiler is operating properly, hold the nose of the bar about six inches away from a piece of cardboard and run the saw full throttle. You should see an oily stripe form on the cardboard. Adjust the oiler if necessary according to manufacturer instructions. 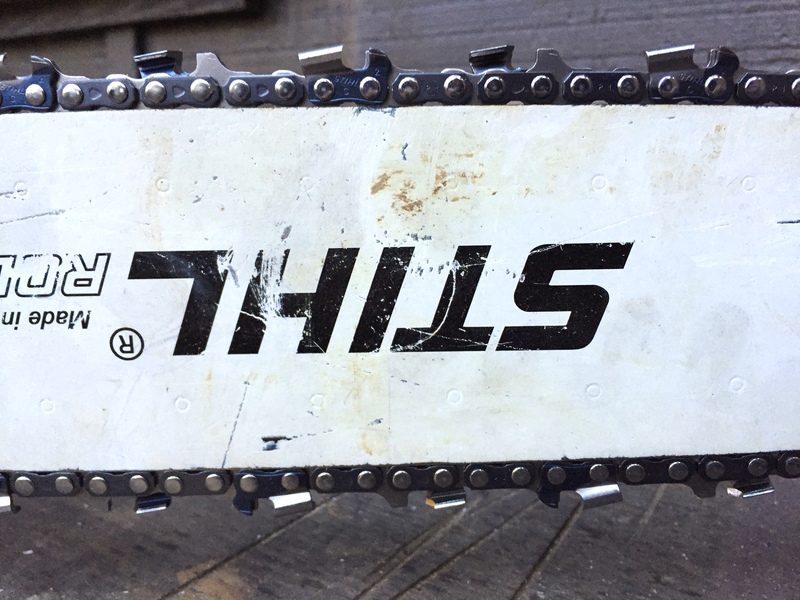 Stihl makes an environmentally friendly bar and chain oil called BioPlus. Be a responsible forester and use it instead of synthetics especially if you often cut things up out in the wilds. Seriously. Thank God there are experts at things. Tip # 1 Also clean out the grove in the rails and oil hole in rear of bar. Hardest thing on a bar AND sprocket is a loose chain-keep snug. If rails are wearing unevenly, lightly use a grinder to even them being careful to keep square. Tip # 2 Find a place that sells regular gas without the alcohol. I purchase mine at a Cenex dealer, little more expensive but worth the price. Also I run the gas in all my small engines, lawn mowers, roto tiller, log splitter, generators etc. Tip # 3 The oil is important if you want to keep the bar, chain, and sprocket working well. However there is another thing when sharpening the chain. Never pull the chain backwards on the saw as this will cause the bar oiler screw to get messed up. Does something with the worm screw. I like your style, Dew. Really, great tips for me! That is a great post, informative and helpful as well! Thank you very much for sharing.